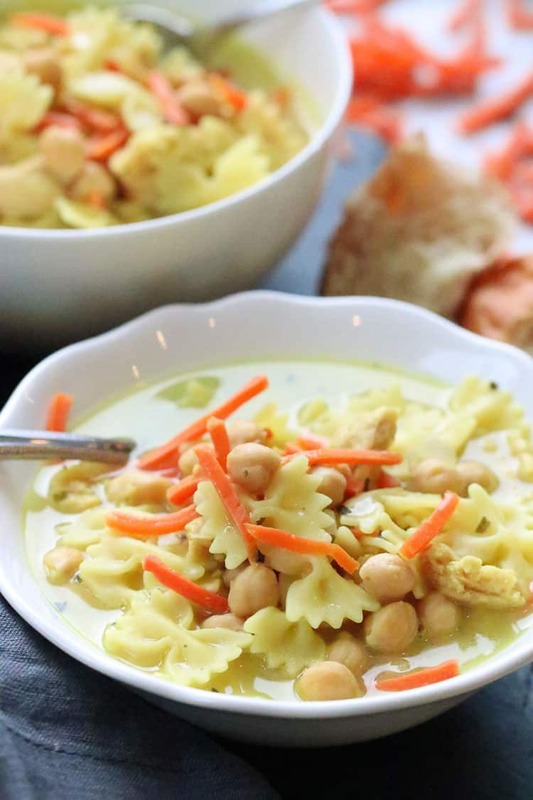 This heart-warming but simple vegan chicken noodle soup is absolutely crave-worthy! 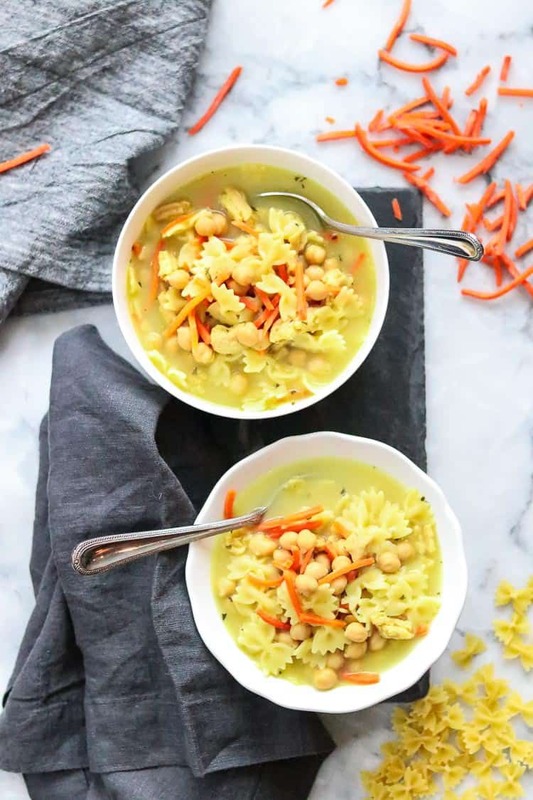 There are times when you just need a warm and savory broth to shamelessly slurp, and the added chickpeas, soy curls, noodles and carrots give this delicious soup texture and backbone. For this recipe, my favorite is the McKay’s but the other options work well too if you prefer or can access them easier. 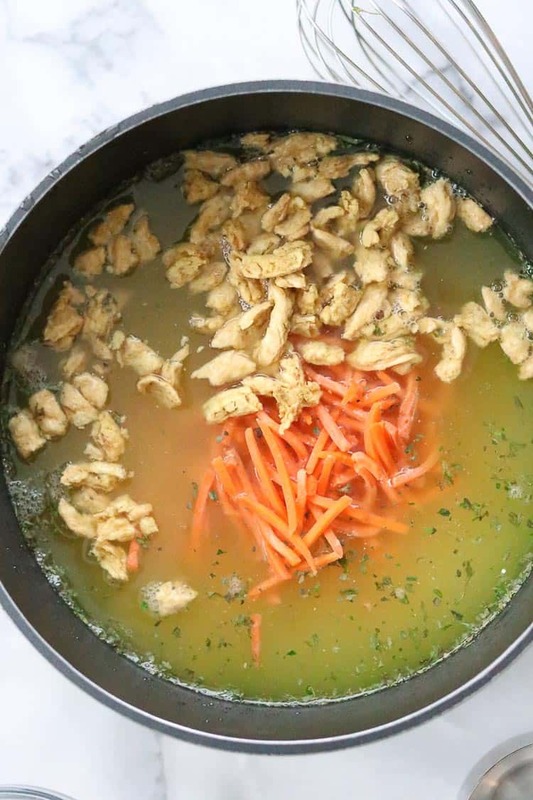 Add water, chicken-style seasoning, onion powder, dried basil and parsley, garlic seasoning, saffron, olive oil, shredded or diced carrots, soy curls and chickpeas to a large stock pot. Bring to a boil. Go ahead and break up your soy curls (if adding) into small pieces before adding to the pot. They grow a LOT!! Now that everything else is boiling, you can add the noodles – your favorite gluten-free noodles work fine too! After adding the noodles, bring the soup back to a slow boil and cook for about 15 minutes. Remove from heat and let cool a little before serving! If you don’t have the saffron, this soup will still taste amazing without it. However if you can get it, I’m completely involve with the depth of flavor and aroma just a pinch adds! 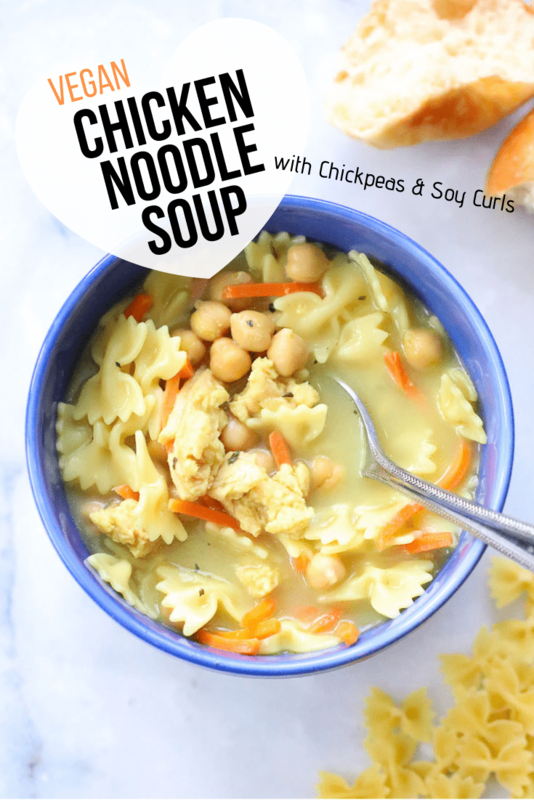 You can leave out the soy curls and substitute tofu or other vegan chicken protein or just go with the chickpeas! If it’s an option for you, my family loves the chewy texture that soy curls add! This soup will last around 5 days in the refrigerator. 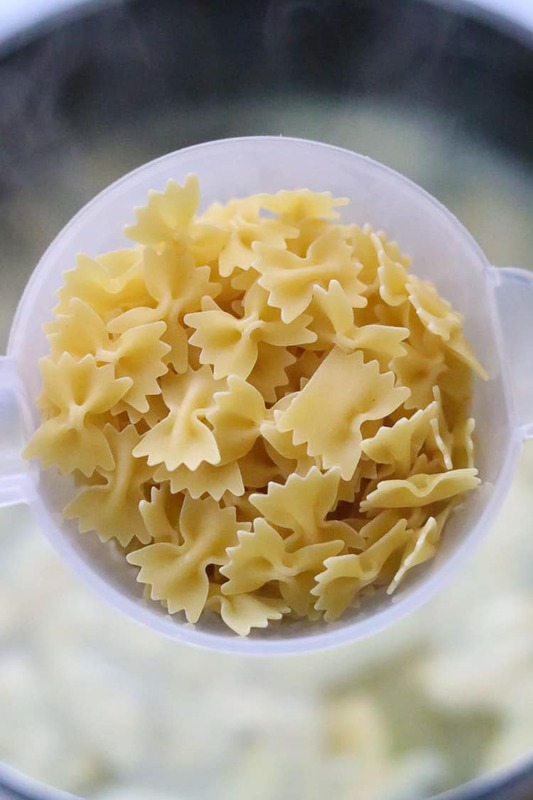 Unless you store the noodles separately, they will tend to absorb more liquid and soften further… but if truth be told, I do it all the time and still love it! 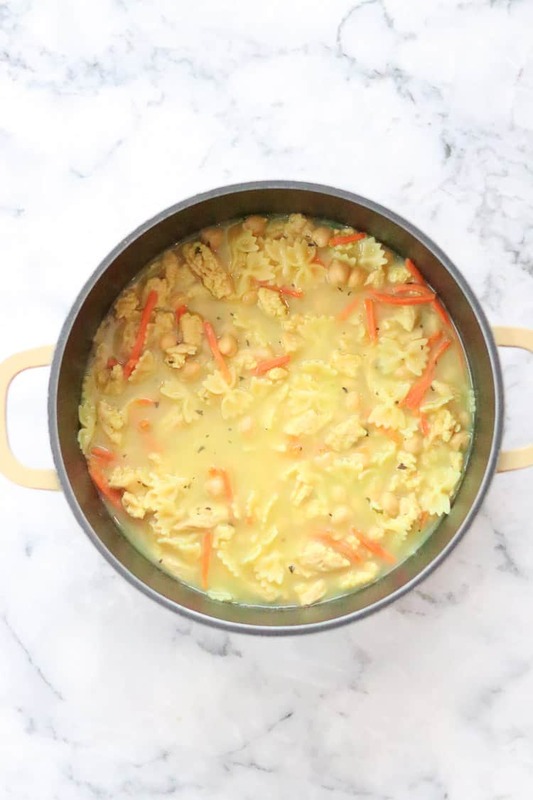 Great for colds, or just because you love it – I hope you have fun with this delicious, satisfying, and nourishing vegan chicken noodle soup recipe! Special thanks to my friend Sarah for the original recipe! 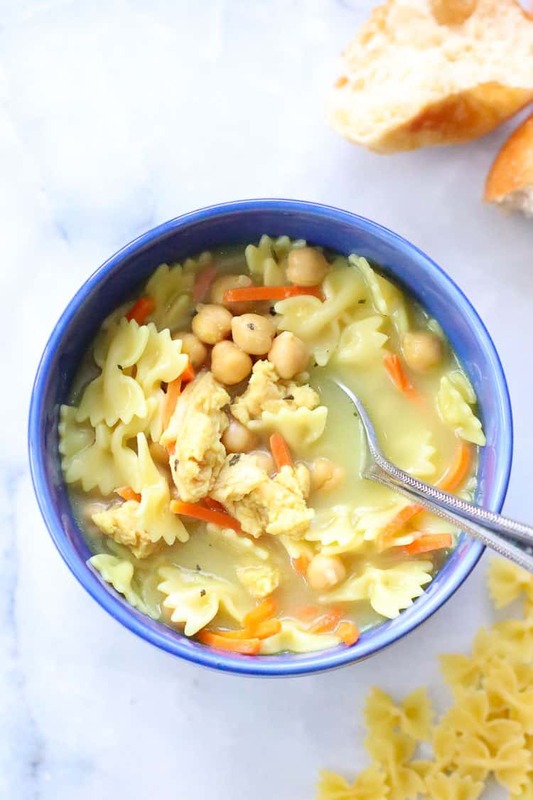 If you’ve tried this Vegan Chicken Noodle Soup or any other recipe on my blog then don’t forget to rate the recipe and let me know how you got on in the comments below, I LOVE hearing from you! You can also FOLLOW MEon FACEBOOK, INSTAGRAM and PINTEREST to see more delicious food and what this blueberry farm girl is keepin’ busy doing!!! 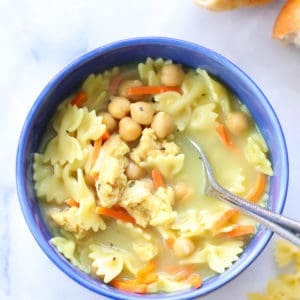 This easy vegan Chicken Noodle Soup has a wonderful-comforting vegan no chicken broth base, and chickpeas and soy curls to help provide protein! Absolutely an all-round favorite! Add all ingredients except pasta to a large stock pot. Bring to a boil. Once boiling, add the noodles. Return the soup to a slow boil and cook for about 15 minutes. Let cool a bit before serving and add salt to taste! 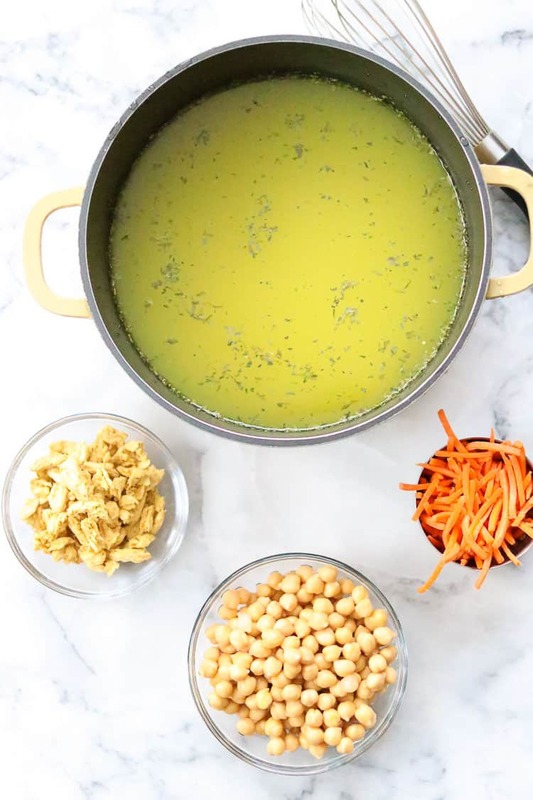 Depending on which vegan chicken-style seasoning you choose, you may need to add slightly more chicken-seasoning and/or salt to achieve the right broth richness! If you don't have the saffron, this soup will still taste amazing without it. However if you can get it, I'm completely involve with the depth of flavor and aroma just a pinch adds! You can leave out the soy curls and substitute tofu or other vegan chicken protein or just go with the chickpeas! If it's an option for you, my family loves the chewy texture that soy curls add! This soup will last around 5 days in the refrigerator. Unless you store the noodles separately, they will tend to absorb more liquid and soften further... but if truth be told, I do it all the time and still love it! Where does someone find soy curls? Hi Christine! I usually buy mine off of Amazon, but they are fairly easy to find in most health food stores or you can buy direct from http://www.butlerfoods.com I LOVE soy curls! Hope that helps! !